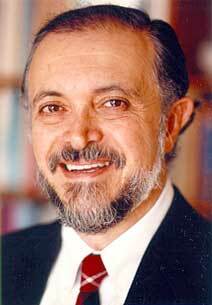 In 1995, Mario Molina received a Nobel prize in chemistry for his work in atmospheric chemistry and the effect of chlorofluorocarbons (CFCs) on the depletion of the ozone layer. He shared the Nobel Prize with F. Sherwood Rowland and Paul Crutzen. This was the first time a Nobel Prize for research into the impact of man-made objects on the environment was awarded. The discoveries led to an international environmental treaty, which bans the production of industrial chemicals that reduce the ozone layer. Dr. Molina was named one of the top 20 Hispanics in Technology, 1998. Today, Dr. Molina is one of the world's most knowledgeable experts on pollution and the effects of chemical pollution on the environment. Mexican-born scientist Dr. Molina is currently the Lee and Geraldine Martin Professor of Environmental Sciences at the Massachusetts Institute of Technology. "It's very rewarding to see how one can simultaneously try to work with problems that affect society in a very direct way," he says. Autobiography I was born in Mexico City on March 19, 1943; my parents were Roberto Molina Pasquel and Leonor Henriquez de Molina. My father was a lawyer; he had a private practice, but he also taught at the National University of Mexico (Universidad Nacional Autonoma de Mexico (UNAM)). In his later years, after I had left Mexico, he served as Mexican Ambassador to Ethiopia, Australia and the Philippines. I attended elementary school and high school in Mexico City. I was already fascinated by science before entering high school; I still remember my excitement when I first glanced at paramecia and amoebae through a rather primitive toy microscope. I then converted a bathroom, seldom used by the family, into a laboratory and spent hours playing with chemistry sets. With the help of an aunt, Esther Molina, who was a chemist, I continued with more challenging experiments along the lines of those carried out by freshman chemistry students in college. Keeping with our family tradition of sending their children abroad for a couple of years, and aware of my interest in chemistry, I was sent to a boarding school in Switzerland when I was 11 years old, on the assumption that German was an important language for a prospective chemist to learn. I remember I was thrilled to go to Europe, but then I was disappointed in that my European schoolmates had no more interest in science than my Mexican friends. I had already decided at that time to become a research chemist; earlier, I had seriously contemplated the possibility of pursuing a career in music - I used to play the violin in those days. In 1960, I enrolled in the chemical engineering program at UNAM, as this was then the closest way to become a physical chemist, taking math-oriented courses not available to chemistry majors. After finishing my undergraduate studies in Mexico, I decided to obtain a Ph.D. degree in physical chemistry. This was not an easy task; although my training in chemical engineering was good, it was weak in mathematics, physics, as well as in various areas of basic physical chemistry - subjects such as quantum mechanics were totally alien to me in those days. At first I went to Germany and enrolled at the University of Freiburg. After spending nearly two years doing research in kinetics of polymerizations, I realized that I wanted to have time to study various basic subjects in order to broaden my background and to explore other research areas. Thus, I decided to seek admission to a graduate program in the United States. While pondering my future plans, I spent several months in Paris, where I was able to study mathematics on my own and I also had a wonderful time discussing all sorts of topics, ranging from politics, philosophy, to the arts, etc., with many good friends. Subsequently, I returned to Mexico as an Assistant Professor at the UNAM and I set up the first graduate program in chemical engineering. Finally, in 1968 I left for the University of California at Berkeley to pursue my graduate studies in physical chemistry. During my first year at Berkeley, I took courses in physics and mathematics, in addition to the required courses in physical chemistry. I then joined the research group of Professor George C. Pimentel, with the goal of studying molecular dynamics using chemical lasers, which were discovered in his group a few years earlier. It was also at that time that I met Luisa Tan, who was a fellow graduate student in Pimentel's group and who later became my wife and close scientific collaborator. George Pimentel was also a pioneer in the development of matrix isolation techniques, which is widely used in the study of the molecular structure and bonding of transient species. He was an excellent teacher and a wonderful mentor; his warmth, enthusiasm, and encouragement provided me with inspiration to pursue important scientific questions. My graduate work involved the investigation of the distribution of internal energy in the products of chemical and photochemical reactions; chemical lasers were well suited as tools for such studies. At the beginning I had little experience with the experimental techniques required for my research, such as handling vacuum lines, infrared optics, electronic instrumentation, etc. I learned much of this from my colleague and friend Francisco Tablas, who was a postdoctoral fellow at that time. Eventually I became confident enough to generate original results on my own: my earliest achievement consisted of explaining some features in the laser signals - that at first sight appeared to be noise - as "relaxation oscillations," predictable from the fundamental equations of laser emission. My years at Berkeley have been some of the best of my life. I arrived there just after the era of the free-speech movement. I had the opportunity to explore many areas and to engage in exciting scientific research in an intellectually stimulating environment. It was also during this time that I had my first experience dealing with the impact of science and technology on society. I remember that I was dismayed by the fact that high-power chemical lasers were being developed elsewhere as weapons; I wanted to be involved with research that was useful to society, but not for potentially harmful purposes. After completing my Ph.D. degree in 1972, I stayed for another year at Berkeley to continue research on chemical dynamics. Then, in the fall of 1973, I joined the group of Professor F. Sherwood (Sherry) Rowland as a postdoctoral fellow, moving to Irvine, California, with Luisa; we married in July of that year. Sherry had pioneered research on "hot atom" chemistry, investigating chemical properties of atoms with excess translational energy and produced by radioactive processes. Sherry offered me a list of research options: the one project that intrigued me the most consisted of finding out the environmental fate of certain very inert industrial chemicals - the chlorofluorocarbons (CFCs) - which had been accumulating in the atmosphere, and which at that time were thought to have no significant effects on the environment. This project offered me the opportunity to learn a new fieldatmospheric chemistry-about which I knew very little; trying to solve a challenging problem appeared to be an excellent way to plunge into a new research area. The CFCs are compounds similar to others that Sherry and I had investigated from the point of view of molecular dynamics; we were familiar with their chemical properties, but not with their atmospheric chemistry. Three months after I arrived at Irvine, Sherry and I developed the "CFC-ozone depletion theory." At first the research did not seem to be particularly interesting - I carried out a systematic search for processes that might destroy the CFCs in the lower atmosphere, but nothing appeared to affect them. We knew, however, that they would eventually drift to sufficiently high altitudes to be destroyed by solar radiation. The question was not only what destroys them, but more importantly, what are the consequences. We realized that the chlorine atoms produced by the decomposition of the CFCs would catalytically destroy ozone. We became fully aware of the seriousness of the problem when we compared the industrial amounts of CFCs to the amounts of nitrogen oxides which control ozone levels; the role of these catalysts of natural origin had been established a few years earlier by Paul Crutzen. We were alarmed at the possibility that the continued release of CFCs into the atmosphere would cause a significant depletion of the Earth's stratospheric ozone layer. Sherry and I decided to exchange information with the atmospheric sciences community: we went to Berkeley to confer with Professor Harold Johnston, whose work on the impact of the release of nitrogen oxides from the proposed supersonic transport (SST) aircraft on the stratospheric ozone layer was well known to us. Johnston informed us that months earlier Ralph Cicerone and Richard Stolarski had arrived at similar conclusions concerning the catalytic properties of chlorine atoms in the stratosphere, in connection with the release of hydrogen chloride either from volcanic eruptions or from the ammonium perchlorate fuel planned for the space shuttle. We published our findings in Nature, in a paper which appeared in the June 28, 1974 issue. The years following the publication of our paper were hectic, as we had decided to communicate the CFC - ozone issue not only to other scientists, but also to policy makers and to the news media; we realized this was the only way to insure that society would take some measures to alleviate the problem. To me, Sherry Rowland has always been a wonderful mentor and colleague. I cherish my years of association with him and my friendship with him and his wife, Joan. While he was on sabbatical leave in Vienna during the first six months of 1974, we communicated via mail and telephone. There were many exchanges of mail during this short period of time, which illustrated the frantic pace of our research at that time while we continued to refine our ozone depletion theory. Soon after, Sherry and I published several more articles on the CFC-ozone issue; we presented our results at scientific meetings and we also testified at legislative hearings on potential controls on CFCs emissions. In 1975, I was appointed as a member of the faculty at the University of California, Irvine. Although I continued to collaborate with Sherry, as an assistant professor I had to prove that I was capable of ponducting original research on my own. I thus set up an independent program to investigate chemical and spectroscopic properties of compounds of atmospheric importance, focusing on those that are unstable and difficult to handle in the laboratory, such as hypochlorous acid, chlorine nitrite, chlorine nitrate, peroxynitric acid, etc. It was in those years that Luisa, my wife, began collaborating with me, providing invaluable help in carrying out those difficult experiments. We also started then to raise a family: our son, Felipe, was born in 1977. Initially, Luisa had a teaching and research position at Irvine; however, after Felipe was born, she decided to work only part-time so that she could devote more time to Felipe. Fortunately for me, she decided to join my research group. Throughout the years, she has been very supportive and understanding of my preoccupation with work and the intense nature of my research. Although my years at Irvine were very productive, I missed not doing experiments myself because of the many responsibilities associated with a faculty position: teaching courses, supervising graduate students, meetings, etc. After spending seven years at Irvine as Assistant and then Associate Professor, I decided to move to a non-academic position. I joined the Molecular Physics and Chemistry Section at the Jet Propulsion Laboratory in 1982. I had a smaller group - only a few postdoctoral fellows - but I also had the luxury of conducting experiments with my own hands, which I enjoyed very much. Indeed, I spent many hours in the laboratory in those years, conducting measurements and developing techniques for the study of newly emerging problems. Around 1985, after becoming aware of the discovery by Joseph Farman and his co-workers of the seasonal depletion of ozone over Antarctica, my research group at JPL investigated the peculiar chemistry which is promoted by polar stratospheric clouds, some of which consist of ice crystals. We were able to show that chlorine-activation reactions take place very efficiently in the presence of ice under polar stratospheric conditions; thus, we provided a laboratory simulation of the chemical effects of clouds over the Antarctic. Also, in order to understand the rapid catalytic gas phase reactions that were taking place over the South Pole, Luisa and I carried out experiments with chlorine peroxide, a new compound which had not been reported previously in the literature and which turned out to be important in providing the explanation for the rapid loss of ozone in the polar stratosphere. In 1989 I returned to academic life, moving to the Massachusetts Institute of Technology, where I have continued with research on global atmospheric chemistry issues. After taking off for a few years, Luisa rejoined my research group. Our son is now in college: besides science, he also has an interest in music; he has been playing piano for over 10 years. Although I no longer spend much time in the laboratory, I very much enjoy working with my graduate and postdoctoral students, who provide me with invaluable intellectual stimulus. I have also benefited from teaching; as I try to explain my views to students with critical and open minds, I find myself continually being challenged to go back and rethink ideas. I now see teaching and research as complementary, mutually reinforcing activities. When I first chose the project to investigate the fate of chlorofluorocarbons in the atmosphere, it was simply out of scientific curiosity. I did not consider at that time the environmental consequences of what Sherry and I had set out to study. I am heartened and humbled that I was able to do something that not only contributed to our understanding of atmospheric chemistry, but also had a profound impact on the global environment. One of the very rewarding aspects of my work has been the interaction with a superb group of colleagues and friends in the atmospheric sciences community. I truly value these friendships, many of which go back 20 years or more, and which I expect to continue for many more years to come. I feel that this Nobel Prize represents a recognition for the excellent work that has been done by my colleagues and friends in the atmospheric chemistry community on the stratospheric ozone depletion issue. Addendum, May 2006 My wife is Guadalupe Alvarez; I am no longer married to Luisa Molina. My son Felipe finished his medical school studies and is now a physician in Boston. ; In 2005 I moved from MIT to the University of California, San Diego, and also to Mexico City, where I created a new center for strategic studies in energy and environment. My current work is related to air quality and global change issues. I collaborate with colleagues from many other disciplines on the problem of rapidly growing cities with serious air pollution problems. In Mexico City we have succeeded in improving air quality significantly, although much work remains to be done. My research group in San Diego is investigating chemical properties of atmospheric particles. The goal is to better understand the effect of these particles on clouds and climate.